This lazy person fruit tray can hold food on the top and shell on the bottom. Sit to eat, lie to eat, you can eat wherever you want, convenient and practical. While eating while throwing shell, convenient and practical. The edge is polished smooth, does not hurt the hand, is more convenient to take. The upper layer of the fruit plate is designed with asphalt holes to remove water and keep it clean and hygienic. Five different colors for your choice. 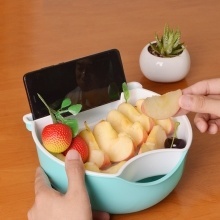 It is also a mobile phone holder, which can enjoy the fun of watching while eating.